Saint Herman (1150?-1241) was a member of the Premonstratensian Order and a mystic. Born in Cologne, he was the son of Count Lothair of Meer, and his mother was Saint Hildegund. He was well educated, and it was known that from his earliest youth he spent all of his free time praying to the Blessed Virgin at the local church of Saint Mary. Once, while still a young boy, he innocently offered an apple saved from his own lunch to a statue of Our Lord, and was not surprised when a hand was extended and the apple was accepted. One bitterly cold winter’s day, as little Saint Herman was walking barefoot into church, the Blessed Virgin Mary appeared to him to inquire why he was going about barefoot in such freezing weather. "Alas! Dear Lady," Saint Herman answered, "it is because my parents are so poor." 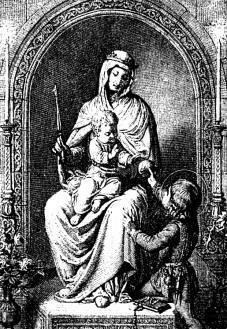 The Blessed Virgin pointed to a stone nearby, instructing little Herman to look under it. He promptly obeyed, and found four pieces of silver, just what he would need to purchase new shoes. Returning to give thanks to his Blessed Mother, in another apparition to Saint Herman, she directed him to return to the same spot with faith and confidence that his needs would be met, and then departed. Never did he want for any necessity, though his friends, animated by a different spirit, would never find anything when they looked beneath the stone. On another occasion Saint Herman saw the Blessed Virgin high up in the tribune, conversing with the Child Jesus and St. John. He longed to join them, but sadly realized there was no way for him to do so. Suddenly, Herman found himself at their side and began conversing with the Infant Jesus. 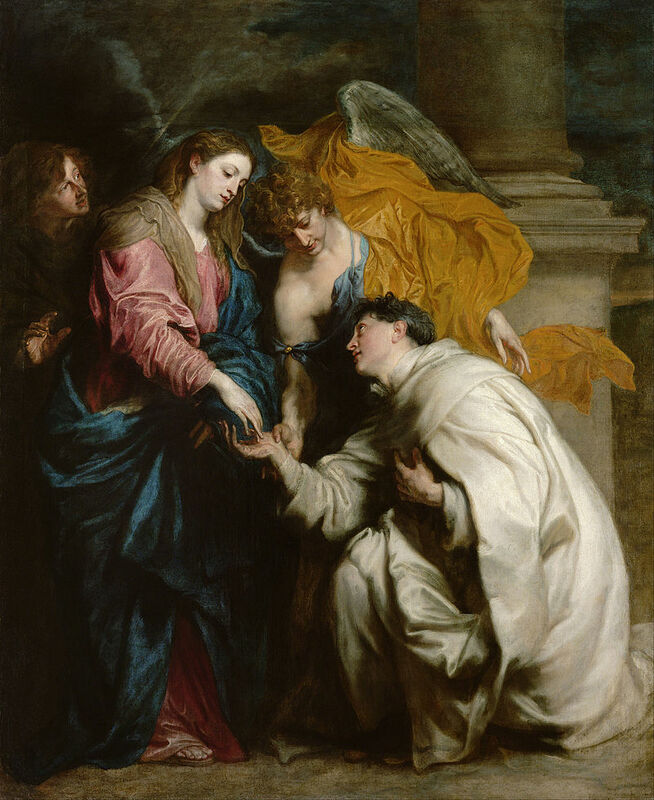 At age twelve Saint Herman went to the Norbertine, or Premonstratensian, house at Steinfeld, and was sent to continue his studies in the Netherlands because of his youth. Once he had completed his studies, he returned and was allowed to join the order and was made sacristan and also served in the refectory. Because of his purity, Herman's fellow-novices soon began calling him Joseph, in honor of Our Lord’s foster father. When he objected to such high praise, the Blessed Virgin Mary appeared to him and took him as her spouse, confirming that it was her desire that he should accept the name. St. Herman's life was one of hardship and penance, for he suffered frequent temptations and had numerous physical illnesses. One illness he suffered from was a constant headache that only went away when he began to celebrate Mass. The pain would become more intense at the approach of Feast Days. Probably because of these sufferings, St. Herman was known to have sympathy for those who suffered afflictions, and they found in him friendship and help to bear their crosses. Pope Pius XII formally recognized that Joseph Herman was a saint in the year 1958.